Okonomiyaki is a savory pancake and is made with vegetables, meat, seafood, and other ingredients, cooked on a griddle with flour-based batter and served with special sauce. 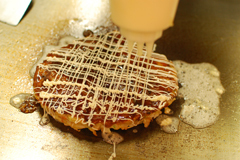 While Kansai-style okonomiyaki is prepared by pre-mixing the ingredients and batter together before cooking, Hiroshima-style okonomiyaki is made by cooking the batter and ingredients in layers without mixing them on the griddle. Besides these two popular versions, similar dishes are found in other areas throughout the country. Hiroshima-style okonomiyaki is difficult to cook because it is generally made by layering a heap of chopped cabbage and noodles other ingredients on the pancake. Therefore, at most Hiroshima-style okonomiyaki restaurants, cooks prepare the pancake for customers. On the other hand, Kansai-style okonomiyaki and Tokyo-style monjayaki are cooked by mixing all ingredients together. Therefore, many restaurants serving them often ask customers to cook their own foods on the griddle at the table. You are of course welcome to try making this popular Japanese food by yourself as part of your experience of Japanese culture. However, if you don't feel comfortable cooking by yourself, ask servers if they can prepare the dish for you instead. Takoyaki is a ball-shaped pancake that is believed to have originated in Osaka.Each ball is about 3 to 5 cm in diameter and contains a piece of octopus meat in its center. 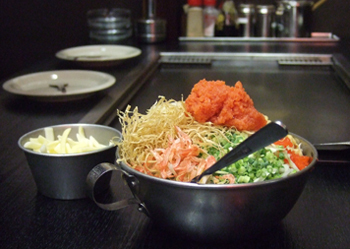 Other common ingredients used for takoyaki are tenkasu (tempura crumbs), negi onion, and benishoga (red pickled ginger). 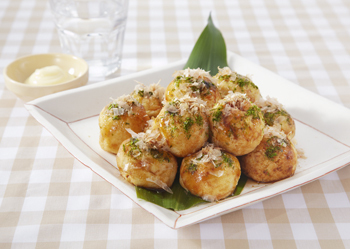 Ideal takoyaki has a lightly-crusty outer surface with inside that is soft and runny like monjayaki. Takoyaki is usually topped with sweet and salty sauce and is sprinkled with aonori (green seaweed) and katsuobushi (dried bonito flakes). Some people like to add mayonnaise on it. As a variant of okonomiyaki, monjayaki is very popular in Tokyo. Monjayaki batter is thinner than that of okonomiyaki and is seasoned with sauce or shoyu before cooking. Monjayaki was once sold at dagashiya (old-fashioned candy store) and was a popular snack for children in the shitamachi area (old downtown) of Tokyo. 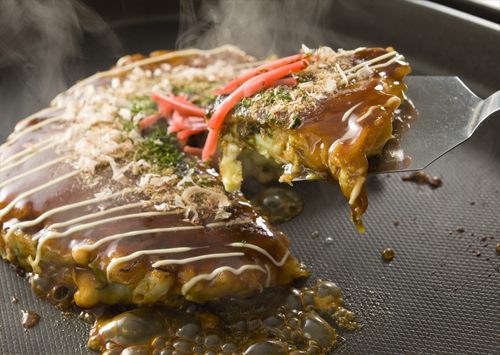 Today, monjayaki is served at specialty restaurants, many of which also serve okonomiyaki as well. 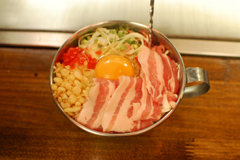 Popular ingredients to be added to okonomiyaki include thin slices of pork, eggs, and agetama (tempura crumbs). See how a delicious okonomiyaki is prepared. Cook through the inside of the pancake. Brush sauce on top of the pancake. Drizzle mayonnaise and sprinkle aonori as you like. Cut into smaller pieces to serve. Turn over the okonomiyaki pancake to cook both sides. 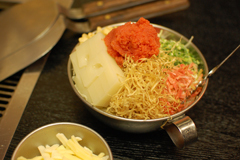 Monja can be made with a variety of ingredients. The following shows a process of preparing shitamachi-style monja with mentaiko (spicy pollock roe) and mochi (rice cake). Pour dashi stock to the griddle. Add cooked mochi and cheese. Monja is ready to eat when the mixture starts boiling. Eat by scraping off and browning a small portion of the mixture. Cook the ingredients on the griddle. Was tea master Sen no Rikyu an inventor of okonomiyaki? The root of okonomiyaki goes back to Sen no Rikyu, a master of chanoyu (Japanese tea ceremony). It is said that at a tea ceremony he hosted, Sen no Rikyu served a cake called fu-no yaki, which was made by mixing flour with water, roasting the flour mixture, and spreading the mixture thin on the pot to cook. The cooked cakes were served with pepper-seasoned miso paste sandwiched between them. In the prewar period in Osaka, a snack called yoshokuyaki was once very popular among locals. Yoshokuyaki was made by spreading a flour-water batter in a circle on a griddle and topping it with negi onions and tenkasu. After the war, the method of cooking gradually changed, and mixing the batter with vegetables and seafood before cooking became common. People started calling the snack okonomiyaki, as it can be cooked with any favorite (konomi) ingredients. Meanwhile, it is believed that the origin of Hiroshima-style okonomiyaki is a snack called issen-yoshoku, which was sold at dagashiya candy stores. Issen-yoshoku was a crape-like snack made from a thin batter and was served by folding the crape in half with such ingredients as bonito powder, green onion, and tororo konbu kelp inside and Worcestershire sauce poured on top. This half-folded style is still common today for okonomiyaki sold at the deli of supermarkets in Hiroshima. The predecessor of monjayaki in Tokyo is believed to be a snack called mojiyaki that was eaten during the Meiji period. Mojiyaki was sold at a dagashiya as a tool to teach children letters by writing the letters with the batter on the griddle placed in front of the shop.